You may think you know where Han's English-language debut novel is going, but you have no idea. At first, its mundane strangeness may remind you of the works of Haruki Murakami: Mr. Cheong, a Seoul businessman wakes up one night to find his wife, Yeong-hye, standing in the kitchen in front of their refrigerator. Mr. Cheong, who is drawn to Yeong-hye for no particular reason other than her passiveness, is taken aback. He's even more surprised when "the most ordinary woman in the world" declares she won't eat meat because she's had a bloody dream. Things get weirder, and you might be reminded of Patrick Süskind's Perfume, as Han's narrative takes a sharp turn in its second part—a tale of obsession, grotesque physicality, and art. Or, as the emotional and physical violence mounts, you might be reminded of Herman Koch's The Dinner for its depiction of the animal baseness lurking just below civility. And then things take a turn again, and Han's third and final part might remind you of Hanya Yanagihara's A Little Life for its display of raw emotion. To go into much detail about how The Vegetarian is both similar to these other works yet also possesses its own singular wonder would do it a disservice. 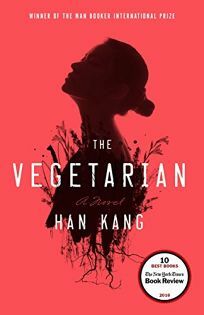 Suffice it to say, Mr. Cheong's true nature is revealed, and Yeong-hye's family members are soon swept up in her mysterious change, which manifests itself in increasingly odd ways: she begins to eat less and less, and then not at all, and she becomes fond of taking off her clothes on sunny days. The atmosphere of growing dread is entrancing and tense, and readers will find a bounty of bizarre, ominous images: an IV bag filling with blood, a bird squeezed in a fist, and a psychiatric ward in the forest where a gloomy rain is continually falling. There—I've already said too much. Yeong-hye, as the center of the novel, forces the other characters to confront what they really want, and to confront what this desire says about who they are. This is a horror story in its depiction of the unknowability of others—of the sudden feeling that you've never actually known someone close to you. It's also a decidedly literary story for its exploration of despair, inner unrest, and the pain of coming to understand yourself. There is much to admire in Han's novel. Its three-part structure is brilliant, gradually digging deeper and deeper into darker and darker places; the writing is spare and haunting; but perhaps most memorable is its crushing climax, a phantasmagoric yet emotionally true moment that's surely one of the year's most powerful. This is an ingenious, upsetting, and unforgettable novel. Gabe Habash is the deputy reviews editor of Publishers Weekly.